One of the things we noticed immediately when viewing the 85X950B XBR series is the black saturation and extremely saturated color. This TV delivers the best performance in black saturation that we have seen for an LED TV – bar none. As a result of the deep blacks, the wide color palette pops like it should, with the color range and saturation and vibrancy being the best of any LED backlit TV we've ever reviewed – thus our highest picture quality rating for the year. When first viewing the other Sony 4K TVs we though we had seen great picture quality but then the X950B is something greater altogether. It trumps the X900B series without a problem in picture quality thanks for the expanded pallete color range of the Triluminous technology combined with the X-tended Dynamic Range, but what you notice as well is that the light flow through from the local dimming backlighting is just incredible, creating one of the clearest we've seen. The other aspect of this TV that bears special mention is the X-Reality 4K engine, the best in the market in our opinion at formatting and converting all types of content and resolutions to the 4K native panel. This engine gives Sony an advantage over Samsung and LG in the performance category. Side viewing angles are not much of a problem on this LED, which is normally a huge issue along with uneven backlighting by the X950B manages these problems with ease. The intense light flow through reduces any off angle contrast issues. We originally thought, “Why even bother trying to make a 4K LED compete with OLED which has some natural picture advantages with it's individual pixels.” Sony answered the question with all the picture improvements they have installed in the X950B which easily has double the picture technologies of any other LED backlit TV on the market, including their new X850B series which lacks the X-teneded Dynamic Range feature. We viewed these two side by side and the difference in the LCD panel and light flow through is extremely noticeable. The only picture that will compete with this one for 2014 and early 2015 is the new OLED TVs. Another area that Sony excels in is upconversion tcchnology and the X950B is very solid in this regard. Watching a few You Tube videos showed how well the TV can accommodate a well made video even from a 480p resolution. As with most processing conversions Sony engages in, this one is also very good. Which is good, because this is a feature we have long called not worth using on most TVs. It's content dependent of course, but try it with a BluRay and I think you will be surprised how good it is. 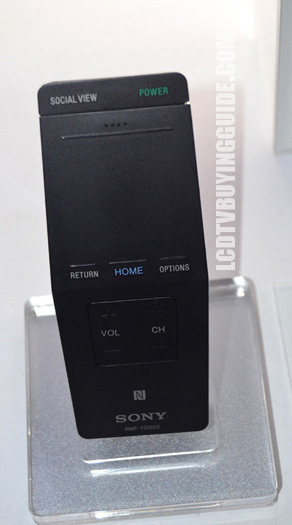 The feature is accessed easily though a dedicated button on the non-touch pad remote control. It does create a more engaging image with more depth, especially for HD sports programming. While the X950B does not have the frameless bezel appearance of sleeker models, the tradeoffs for picture performance is worth it. It takes a little more bezel width in gloss black of a bit less than an inch to house that panel. But it's still a great looking TV. The new layout of the Sony Entertainment Network contains category separations for Movies, Apps, Music, and Albums. It's a very attractive easy to use layout and thankfully, operates much better than 2013's SEN. The Apps selections are more interesting than in the past as well and we see lots of improvement from Sony in this area. 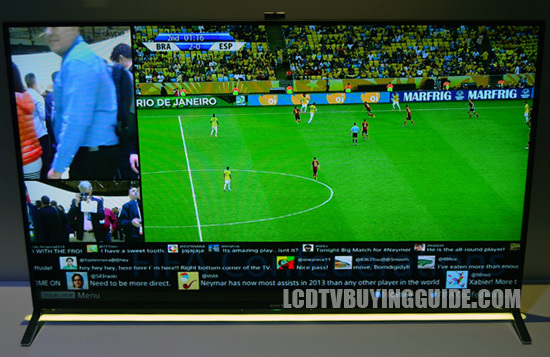 One of the most interesting features on Sony TVs for 2014 and beyond is Social Viewing. You can turn on the Twitter scrolling feed feature to find out what people are tweeting about the programing you are viewing. For many shows like The Voice or The Bachelor or many reality TV shows that creates some fun. But perhaps the best part about this feature from my perspective is to be able to Skype with a split screen and talk to someone about what you are watching. Keep in mind that your company on Skype will also need to have this functionality in their TV either a Sony with Split screen Skyping or something similar from another brand. For example, imagine watching that intense college football game while talking to your best buddy about it on Skype right there on the same screen. Fun. Or imagine talking to your friend while watching one of your co-favorite reality shows. You can see where this would definitely add a social aspect aspect to watching TV. In our view of the feature it worked very well. The new jet black matte finish touch pad remote from Sony has a very nice fast responsive touch pad that definitely speeds up scrolling somewhat across Smart TV Apps (over 100) and also speeds up search considerably when typing on the on-screen keypad. Much better than 5-way controller. It does not have a voice recognition feature. For those so used to a smart phone touch control, will likely prefer the touch remote over the standard remote that also comes with the TV (Sony didn’t take any chances there). There is also an iPhone App remote but control with the App is inferior to the touch-pad remote itself. The secondary standard remote is thoughfully well laid out, but not backlit. 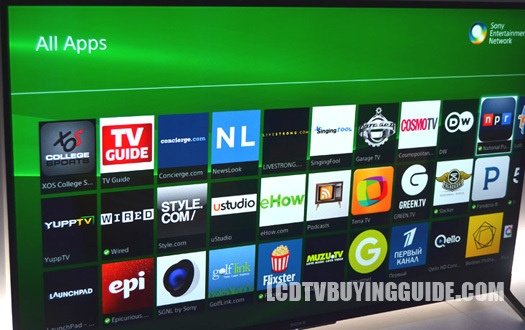 Sony is currently the leader in 4K content and has a streaming box that will hold 40 to 50 4K movies all filmed in 4K. The box is free with the 65” or above (X900B or X950B). Storage of 4K movies is a bear so this is a pretty good perk. The Sony 4K community consists of 140 4K movies at present all of which were filmed in 4K. 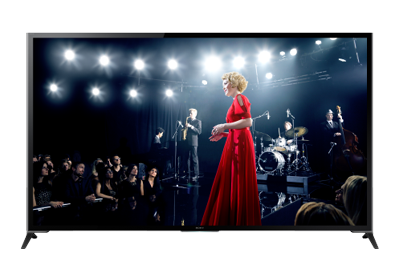 With the X950B you arent just future-proofing with a 4K resolution, you're obtaining a premium picture quality performance that is currently unrivaled in the LED TV market. That's what you really pay for with this model. It's a picture that could have been obtained by the best plasma TVs of years past, but now finally an LED TV is showing what it can do, right when OLED is hitting the market. 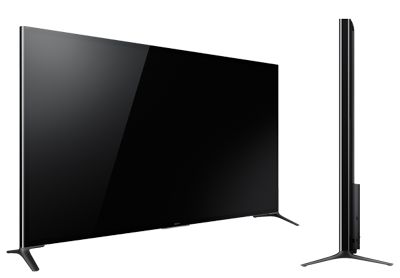 Sony's upconversion technology makes watching 1080p programming. At $25K there is no way we can give the XBR85X950B a great value rating, but there is little on the market to compare it to even the Samsung 9000 series falls short and this is certainly a TV you would want to own for 10 years. The only thing more outrageous perhaps than the picture, is the price. Screen Size (measured diagonally) :84.6"